Another very important milestone in a girl's life is when you receive your first.............pair of converse! 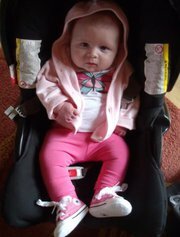 My (gran) niece, Megan got her first pair this week.....pink of course. Of course she had to pop up to see her Godmother Emma, to show them off. While she was sitting there, she noticed something horrendious. Megan: OMG! My godmother is wearing the exact same shoes as me. WTF! Megan was so mortified by this she had to go home immediately to change!